Ladakh in 13 Days – How to Plan Your Itinerary? Itinerary is by far the biggest question that I get asked by people planning to visit Ladakh. Either I am requested to help suggest an entirely new itinerary; or review an existing one for any possible changes. Keeping the same in mind, in the last few articles I have been detailing itineraries for Ladakh broken by the number of days for the trip; and mode of commute. Continuing in the same series, in this post I will provide details on planning an itinerary covering Ladakh in 13 days. Like the previous articles, I will break itineraries in 3 different sets. First one for people traveling by their own vehicle. Second for people who will be relying on public transport completely; and third one for people who flew into Leh City and have the entire 13 days to spend in Ladakh itself. For the sake of this article, I will assume that you are starting from Delhi. If you were however coming from a different city; then only the journey for first and last day will be different. Rest of the details mentioned in the itineraries below will still apply. The biggest reason why planning an itinerary for Ladakh can be confusing is because of the lack of knowledge. Then there is also the fact that you will be covering a fairly large area during this trip. Ladakh happens to be the second largest district in India. Put it together with Manali Leh and Srinagar Leh highways and you will get a huge list of places to visit and things to see. How can you squeeze it all in a single itinerary limited by a certain number of days is what can become a bit tricky. For a list of places to visit during the journey, please read Tourist Attractions in Ladakh – A Comprehensive List. Hopefully, after reading this article, you will have plenty of information to draft your final travel plan. If you have any questions, you may comment towards the bottom of this page and ask. I will begin by first suggesting and detailing an itinerary that I recommend; followed by a few different versions of the same journey. The first itinerary is assuming that you are traveling by your own vehicle. Before I go on explaining the journey further, let me first write about why I am recommending to travel via Srinagar; rather than reaching Ladakh via Manali which most people prefer to do. 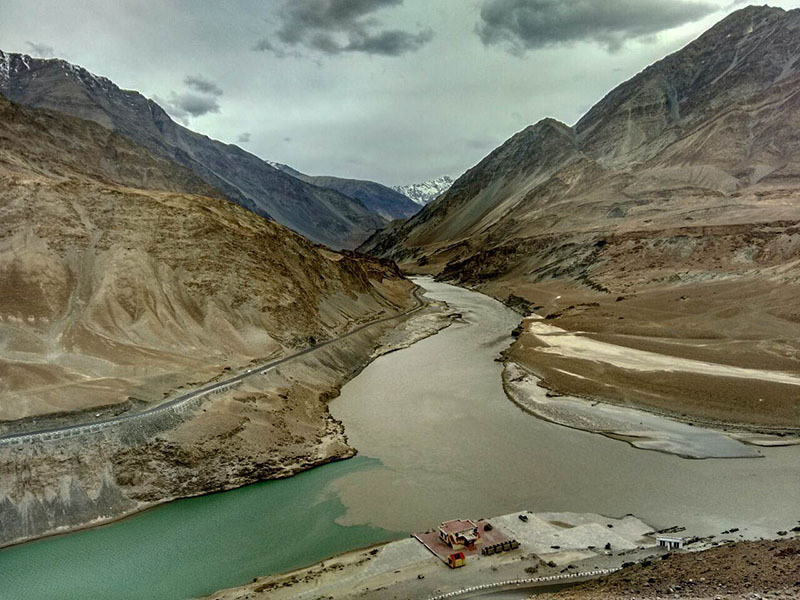 Reaching Ladakh via Srinagar makes the journey easier in terms of altitude sickness. If you went via Manali, the gain in altitude is tremendous and a bit too quick for the body to handle. This is why majority of the people on Manali Leh highway suffer from AMS at either Sarchu, Pang or at any of the high altitude passes. On the other hand, when you go via Srinagar, this gain is a bit gradual; giving our bodies enough time to acclimatize. If you are traveling with family and have kids or elders accompanying you on the trip; I will strongly recommend that you reach Ladakh by Srinagar Leh highway and return via Manali. For more details on what AMS is and what its symptoms are, please read How to Handle Acute Mountain Sickness in Ladakh. If you were bringing your kids along on the journey, then I will also recommend reading How to Plan a Ladakh Trip with Children or Infants. Rohtang La used to be one of the prime attractions of a Ladakh trip but has recently turned into a hassle with all the rules and tourist mania. A permit is now needed to cross Rohtang from Manali side and without it, you will not be able to go any further than Gulaba. Now first of all getting this permit is a bit of a task. It can either be obtained online or in person from DM office in Manali; but is limited in numbers and issued on first come first serve basis. There is a maximum cap on the number of permits issued per day which is further broken into Petrol and Diesel vehicles. During peak tourist season, it is a great challenge to get the permit issued; and is an additional thing for you to worry about. This problem however can be avoided if you reached Ladakh via Srinagar. Permit is only required if you went to Rohtang from Manali side. If you were however coming from other side of the pass towards Manali, then you do not need a permit. Number of people visiting Manali and Rohtang Pass increases by each passing year; causing traffic jams that can last for hours. You are required to submit your permit at a check post at Gulaba and the average wait time there can go as far as 2 to 3 hours. You will find taxis lined up at the check post as early as 4 AM. This again is a hassle that can be avoided by traveling via Srinagar. You will notice in the itinerary above that I have kept 1 day as a buffer. When traveling to a place like Ladakh and for as many as 13 days, it is of utmost importance that you keep one day over and above your entire travel plan. No matter how popular Ladakh my get as a tourist destination, the fact still remains that it is a high altitude desert where the uncertainty factors remains to be quite high. You may be forced to extend your stay at any of the places en route and should be able to afford to do so without running into a problem back home. Now getting back to our itinerary, let me now give a day by day run down of how your journey will be. The reason why I am recommending this particular travel plan is because it ensures that you cover the most, see all that there is to see; without traveling too much on any particular day. Not much to write about this day except for this will be a bit of long and monotonous journey. You will cover about 600 kilometers in 11 to 12 hours. Good news is that the road is good for most part of the journey. There are a few bad patches in between but during the last stretch between Pathankot and Jammu. There will be a lot of tolls between Delhi and Pathankot though. Hotels in Jammu are available in plenty but stay at one closer to Jammu Srinagar highway. Now there are two ways that you can do this journey. Either take the Jammu Srinagar highway which is about 270 kilometers in total. There is a lot of vehicle movement on this road though and traffic jams are common. Reaching Srinagar by this road will easily take you about 11 to 12 hours via Patnitop and Anantnag. An alternate route is via Mughal road. This road is also the longer of the two and runs a total length of around 330 kilometers via Rojouri and Shopian. Traffic however on this road is very less and it also is more scenic of the two roads. For more details; please read How to Travel from Jammu to Srinagar by Mughal Road. And this is when you start your journey on the beautiful Srinagar Leh highway. Condition of the road is mostly smooth for the entire 220 odd kilometers of the journey. You will be traveling via some stunning vistas and towns like Kangan and Sonamarg and Drass. Enjoy the scenic beauty all day and know why Kashmir is fondly called a paradise. Take a lunch break at either Sonamarg or Drass and have some delicious Kashmiri food. Kargil war memorial near Drass is definitely worth a visit. You will also be crossing the high altitude pass of Zoji La in between which is probably the worst patch of the road on this highway. The most important thing to do today is to arrange permits for your journey ahead. This permit is called Inner Line Permit, or ILP in short, and can be obtained either online or in person from DM office in Leh City. It is mandatory for civilian movement in Ladakh and without it, you can go no further than Leh City. For complete process and charges related, please read How to Obtain Inner Line Permit for Ladakh. Good part is that you do not have to go through the hassle of procuring the permit yourself. These days the hotels can keep these arranged for you. The usual charge is Rs. 100 per person apart from the permit cost. So you can talk to someone at the hotel and ask them to get you the ILP while you go for sightseeing in Leh town. Leh Palace, Shanti Stoopa, Leh Market are some of the most common areas visited by tourists. For a complete list, please read Tourist Attractions in Leh City. The first place you will head to for sightseeing in Ladakh is the beautiful Nubra Valley. Diskit is the headquarters of Nubra and that is where you will be staying for the night. From Leh, you will climb up 35 kilometers to Khardung La Pass first and then drive down to Diskit via Khardung Village and Khalsar. The journey is of 120 kilometers and can take you anywhere between 6 to 7 hours to complete, depending on your speed and breaks. Bactrian Camel, Diskit Monastery, Hunder sand dunes are some of the places that you can visit on this day. Read Tourist Places in Nubra Valley for a complete list of must visit attractions in Nubra Valley. Destination next is the beautiful lake of Pangong, which in recent times has become the very symbol of Ladakh. Before you head there however, you may also want to take a short diversion towards Panamik. The entire journey from Diskit to Pangong will take you about 6 hours so you will have some time for sightseeing in Nubra as well. From Diskit, head back to Khalsar and then take the turn towards Panamik. There is a hot water spring at Panamik that you can visit. After spending some time, reach back Khalsar again and this time, take Agham Shyok road to arrive at Pangong Tso. At Pangong, you can either stay at the camp sites or as a paying guest in the village of Spangmik. You will now head back to Leh city but will take a different route to get there. From Pangong, drive back to Durbuk and then take the road towards Chang La to reach Leh City via Karu. Road is mostly good with a bad patch at Chang La. The entire journey will take you about 8 hours so please start from Pangong accordingly. Next place on our itinerary is Tso Moriri. This lake maybe smaller in size than Pangong but an equal in terms of beauty. As opposed to Pangong, it actually is a fresh water lake and there is also wildlife around it. Karzok is the small village on its banks where you will be staying for the night. To reach here, drive all the way to Upshi from Leh and then take the road towards Chumathang. The road condition is mostly good till Chumathang but then turns really bad for the last 50 kilometers between Sumdo and Karzok. From Karzok, you will head back home straight without coming back to Leh so please check out of the hotel and carry all your belongings with you. Do not leave anything behind. From Karzok, drive back 50 kilometers again to Sumdo. From Sumdo, take the road towards Tso Kar via Polo Kongka La. You will drive across More Plains, reach Tso Kar and exit on Manali Leh highway near Debring. Now depending on the time you took to reach here, you can either stay at Pang which is nearby; or go to Sarchu which is about another 70 kilometers from Pang. As a rule, if you reach Pang by 3 PM then go to Sarchu. If you arrive here at 4 or later, then stay at Pang itself. You may also want to take an early start from Karzok for this day. Not much to write about this day except for that it will be a long journey back home. Manali is about 550 kilometers from Delhi and it can take as many as 14 to 15 hours to reach home. You can use this day to stay at any places on the itinerary as per your liking but I will recommend waiting until the end; and exhausting this day in last couple of days of the trip. From Karzok, start by 10 AM after some sightseeing at the lake and arrive at Pang. Stay there for the night and come to Jispa the next day rather than driving non-stop all the way to Manali. From Jispa then, you can reach Manali the next day using your additional day here. Or you can just come back home on Day 12 itself and use Day 13 to relax a day at home before getting back to work. And this is it. That was your 13 days trip to Leh Ladakh. This of course is just one of the many ways that you can complete this trip. Having 13 days in hand definitely gives you several choices of changing and tweaking your itinerary. Let me also suggest a few other examples as well in case you did not like the first itinerary. The above mentioned plan was best for someone traveling by their own vehicle. For someone making this trip by public transport, I will recommend an itinerary like below. Public transport here will be in form both buses and shared taxis. You will however rely more on shared taxis rather than a Bus. Keeping an additional day as buffer will be even more important if traveling by public transport. If you were flying into Leh and had the entire 13 days to spend in Ladakh itself, then you can plan your itinerary like below. You can use the buffer days to extend your stay at any of the places in the itinerary. I will recommend using at least one day to stay back in Leh on Day 2 as well. This will give your body more time to acclimatize to high altitude before you start traveling to other places. People who catch a flight to Ladakh are in fact more prone to AMS rather than people who drove there. If you were eager on starting your trip from Manali only and return via Srinagar then the itinerary can be like below. The plan below is assuming that you were able to arrange your Rohtang Permit in advance online; or by either contacting a travel agent; or a hotel in Manali. If you have been to Ladakh before and wanted to cover Zanskar this time then plan like this. If you were flying into Leh and wanted to cover both Ladakh and a bit of Kashmir as well then you can plan your trip like below. You will land into Leh, rent a private taxi for Ladakh sightseeing and journeying to Srinagar; do some sightseeing in Kashmir and then fly out of Srinagar airport. Keep in mind that for visiting places in Kashmir, your Ladakh registered cab will not do and you will have to rent another cab in Srinagar. What I have suggested above are just a few of many ways that this trip can be planned. 13 Days is an ample amount of time and will give you plenty of choice to change your travel plan. I hope the information above on visiting Ladakh in 13 Days was of help. If you have any questions; or need any further help; please feel free to ask in the comments section below; or at our Community Forum; and I will be glad to answer.